Paper Castles: VIDEO TUTORIAL: Stamped Patterns for Cardmaking - Altenew 5th Anniversary Blog Hop! 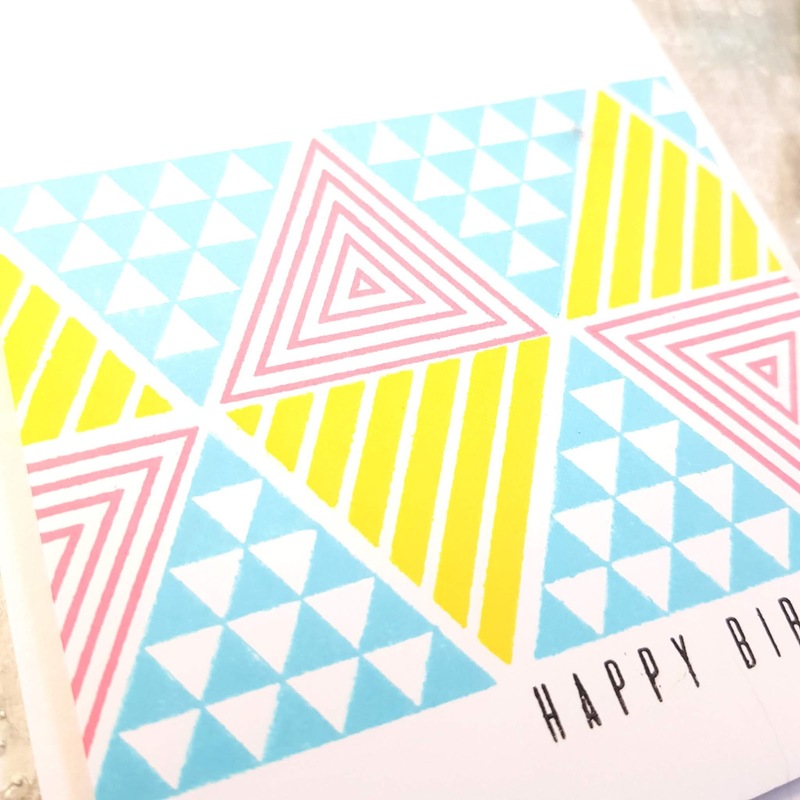 VIDEO TUTORIAL: Stamped Patterns for Cardmaking - Altenew 5th Anniversary Blog Hop! 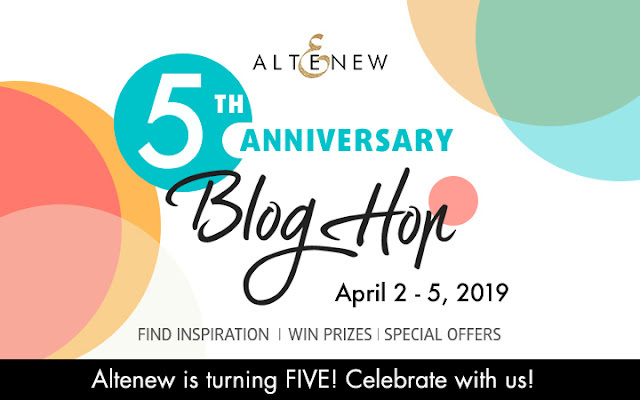 Welcome to a Blog Hop celebrating Altenew's 5th Anniversary! 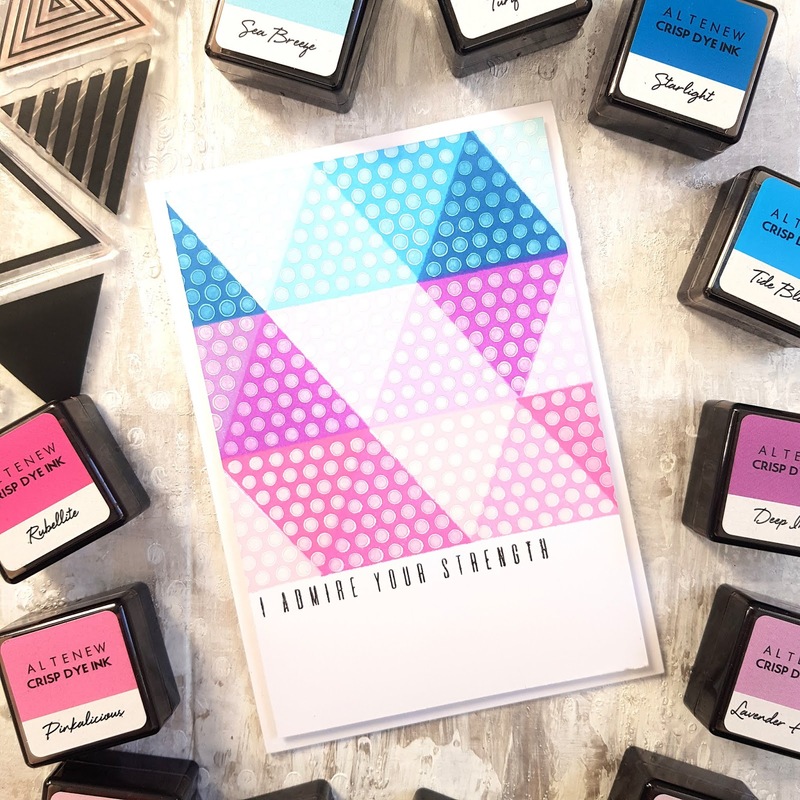 I remember when the company first launched and I was immediately hooked to their beautifully designed stamps and inks that coordinate perfectly with each other! It would be best to start from Altenew's blog to take part in the hop and get a chance to win some amazing prizes! You have probably arrived here from the seriously talented Kymona Tracey's Blog! I made a series of cards using Altenew's Trigonometry Stamp Set which is one of my favourites to use for pattern building. I made a video showing off how to create easy stamped backgrounds for cards and various projects using this set and some of Altenew's Cube Inks! It's fun to see the different kinds of patterns that you can create using this set! This is the card that I made in the video. The cube ink colours work so beautifully together! If you are struggling to find a colour palette that you like, you can have a look in Pinterest for colour inspiration! I stamped with white pigment ink on this card, I love the dimensional look that it gives! Thank you so much for taking part and I hope you all have a great day! Your next stop is Bea Valint! Happy Anniversary to Altenew! love the colors you chose. I love all these pretty details in your design!Thanks for sharing some great inspiration over the years! How fun are these!? Great cards! Too cute. Love the colors and patterns. So fun. I used this set for one of my Altenew favorite cards. I’m so in love with Altenew!! Can’t earn money fast enough to buy all the ones I want but I do have quite a few … about 70 sets to be exact! So happy to be able to purchase them here in Germany!! Congratulations Altenew! And thank you Tania for all your ideas and know-how!! Fun cards. I love the way you used patterns for your backgrounds. Thanks for sharing. I love all of the patterns on your cards, will have to get my stamps out and try this!! Beautiful cards! I love the designs and color combos. I love these! There's another set to add to my wish list. This trigonometry set is wonderful. I can't say that I have seen this before. It is so cool and great for a masculine card too. I love how it appears three dimensional. Thank you! Love these cards! Happy Anniversary to Altenew, and thanks for being part of this blog hop! Deceptively simple-looking cards and really effective. Thank you for the inspiration. These cards are so fun! And I love the colors! Love geometric cards and Altenew. Happy Birthday Altenew! Love your cards. Happy anniversary to Altenew! Fantastic background ideas Tania! Thanks for the inspiration! I love shape cards - as I make a lot of masculine cards. Thanks for the video too! Love what you did here ! Happy Anniversary Altenew , Very pleased to be a part of your success 5 years ago 🌷 , much more success to come . All three cards are so pretty. Love polka dots so that one is my favorite! Beautiful patterns with beautiful colors ... Happy Anniversary Altenew! I love all the geometrics. Great job. So many beautiful backgrounds and I love the patterns! Gorgeous job! Love those geometric background... so cool and colorful! Happy Anniversary Altanew! I have other Altenew basic shapes stamps too and now you gave me awesome ideas how to best use them, yay! I love the altenew flowers...but wow you've made these triangles into fabulous graphic cards. These are beautiful and very retro in design. Gorgeous cards! Love the unique designs. oh I just love all your cards.. such inspiration..
oh my gosh, this set is so versatile! Love the card samples you made with it! Beautifully done! Very neat cards and ideas! Really liking this set! Thanks for your fun creative layouts! Happy Birthday Altenew! I love how you used that trigonometry stamp set! Great fun cards. I really like how you used the smaller triangles. Wow, you sure made a lot of cards. What a great use of this stamp set. So many beautiful designs and so many great cards. The receivers of these cards are winners too. Fun and easy cards! Really like the simple cards and the lovely colors! Love those triangles. You made some fantastic cards. Beautiful work in your design. Love your style and your techniques are amazing. I can't wait for your next post. I always find geometric stamps intriguing but never know how to use them. Love all the cute design ideas you've shown. Happy 5th anniversary to Altenew! Great take on design and color. What great cards! I just love the polka dot triangle one the best! What great cards! Love the bright colors and fun designs. Bright colors and graphic designs!! Loving this hop for all the ideas!! 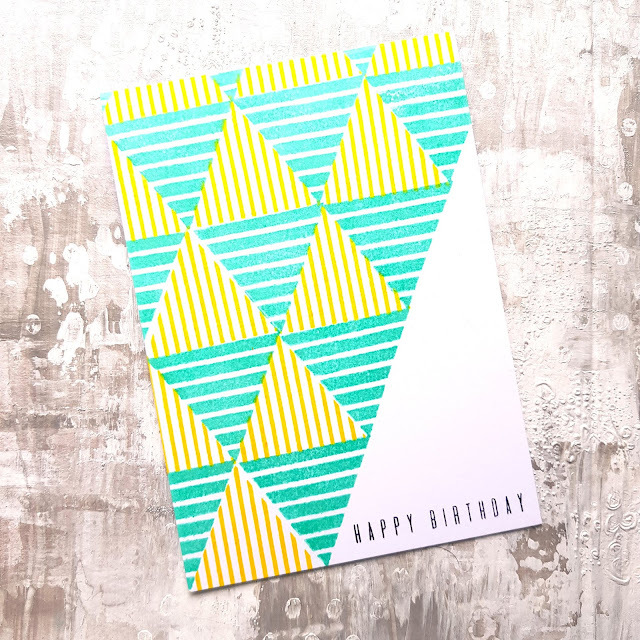 aw, these bright, modern triangle designs are fun! Such wonderful geometric and patterned designs! Those geometric cards are super cool! I had no idea how to use this stamp set. 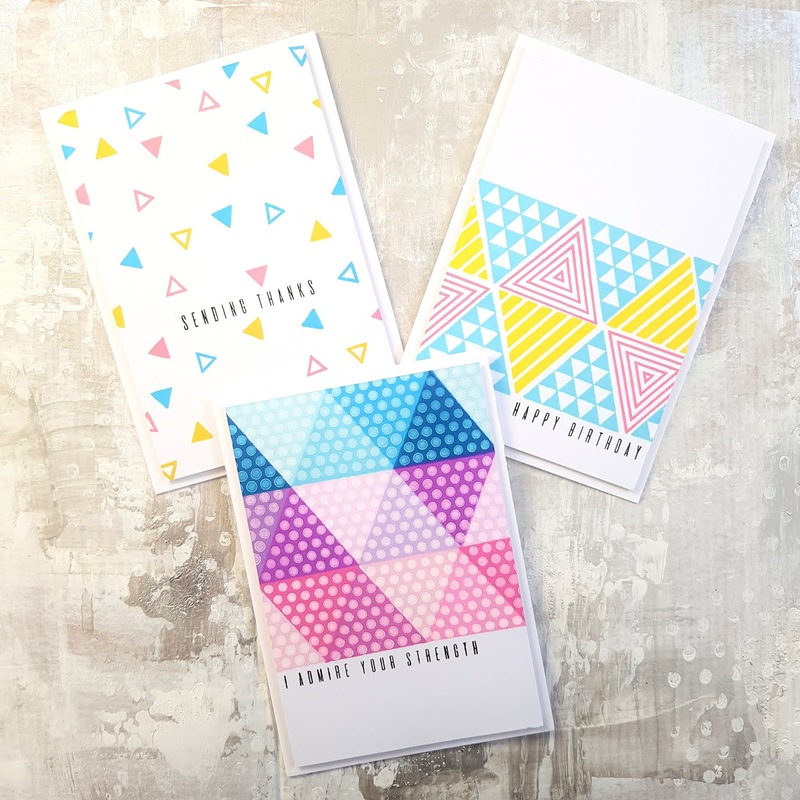 Thanks so much for giving me loads of ideas on how to make beautiful cards with this triangular set. I love all your patterned cards! These are so fun to look at with the bright cheery colors and crisp designs. Wonderful job! I love geometric designs, beautiful cards. Nice job, love the polka dots! Great cards - so bright and bold. Amazing what you can do with just triangles!! These aren't my typical style, but I love them! I'm so impressed by your cards. You have fit those shapes together like a machine! Love those colors. Oh I LOVE the graphic style.. These are SO FUN!!! Thanks for your inspiration for stamped patterns, amazing cards! SO MUCH FUN with geometric shapes!!! Happy Birthday Altenew! 5 years! WOW! Amazing. THANK YOU for all your inspirations!! Wow I love this set and you've done amazing with it. Inspiration! I think your cards turned out great....loved your color combinations. Thank you also for a great video. Super fun blog hop today! I just started teaching my son a geometry unit in math and this would be fun for him to recreate with this set! The triangle card set that you created is lovely! What a super idea. Love the colors! Happy 5th Birthday to Altenew, your cards are so different and lovely! Love your designs - they are look fun to make! Such fun colors and such a great use of the stamps. Thanks for the inspiration! What a versatile stamp set! I like your demonstration of color combos and layouts. Thank you for sharing your work. fun blog hop. fun ideas. thanks as always for sharing. Fun cards - thanks for sharing! What fun! I love to do a geometric card every once in a while! Gets my creative juices going again! Bright and beautiful cards, I love them. Thank you for sharing your inspiration. Tricia Podmore here to tell you I absolutely love your cards, especially that stamp set of shapes. Gorgeous colors and very Artistic! Thanks for sharing such super inspiration. These are just my style! Love them all! These kind of have a retro feel. Really cool! Love the way you used Altenew's trigonometry set. Fabulous group of cards!! Very cute cards! I love the colors! So happy to be celebrating Altenew's 5 year success with you. Thanks for sharing! Gorgeous cards - so fun and vibrant! Cool set of cards, love your imagination! Love the patterns created with this set! Such Fun Cards! Happy Anniversary Altenew. All your cards are beautiful but i love the tiny trangle card the best. thank u for the inspiration. i will bk mark your blog. Congratulations Altenew on the fifth anniversary may youll grow day by day. Fantastic cards! Love the designs using the triangles. ACK! I love these designs!! Thank you for sharing! simple and elegant. Love them! Your cards are gorgeous. I love your use of color and white space to balance the design on your card. What fun designs! Many thanks! I love blog hops because they inspire me to create! Thank you. You created a wonderful set of pretty cards! Thanks for sharing your ideas for different backgrounds. Love your different designs. 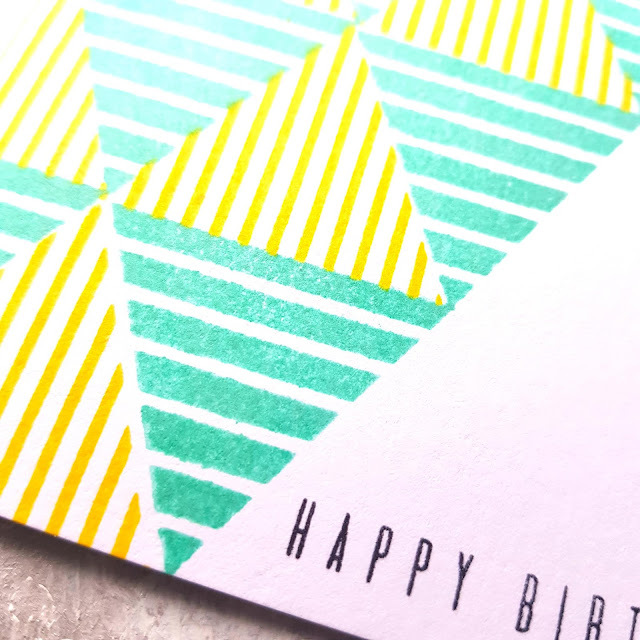 I'm all about geometric shapes so I absolutely love these cards! Something different than the beautiful flowers. Love these cards! Super fun patterns, I just had to save the video to watch later. Awesome job. Thanks for sharing your creativity! I love, love, love geometric design cards. Thank you for the inspiration. Happy 5th Anniversary to Altenew! And thank you for being part of their Blog Hop! Beautiful cards! Thank you for the new ideas for one layer cards! Love to see how you used this set! Altenew stamps and inks made it so fun to layer and blend the colors!!! These cards are vibrant and happy ! Thank you for the tip to use white pigment ink to create dimension. Beautiful cards. Great ideas. Keep up the great work. I have never tried pattern stamping, but now I am going to give it a try. 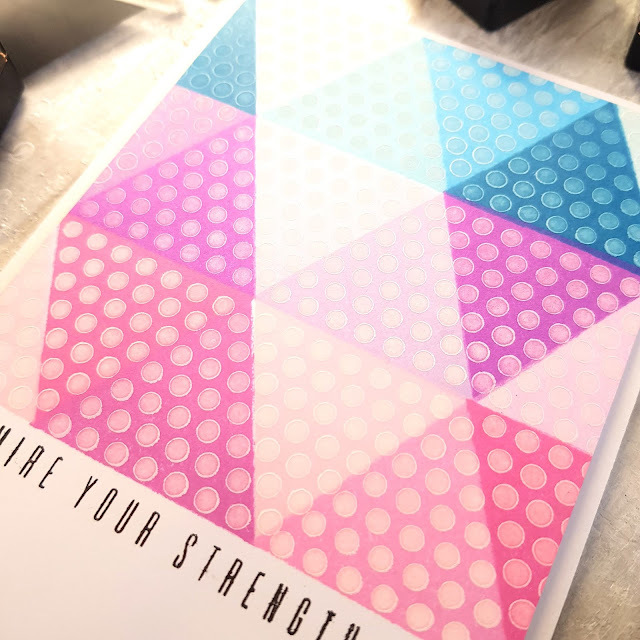 Your patterned stamping is great and an inspiration to me to give it a try. Gorgeous creations! Altenew, CONGRATULATIONS on your 5 year anniversary! What an awesome celebration! Really beautiful one layer cards! Thanks for the inspiration and tutorial! Such fun cards. 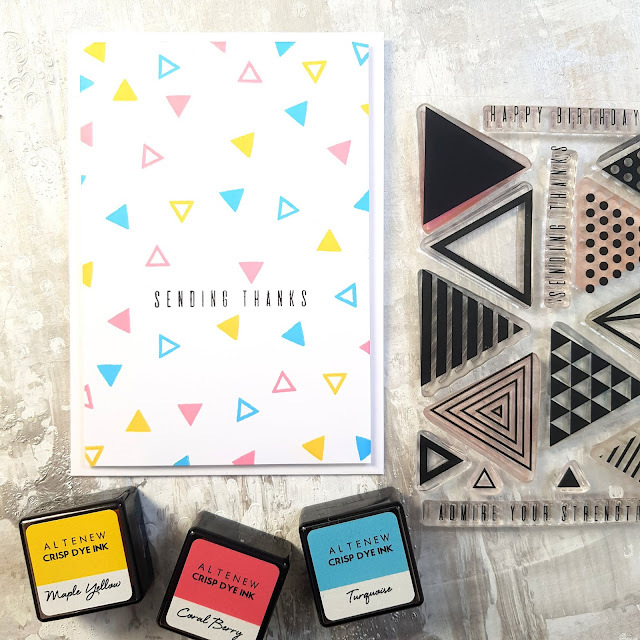 I totally love geometric shapes and need to add this to my stamping library! Happy Anniversary to Altenew! Great ways to use stamps. Love your patterns! BRILLIANT stamping and creating! Bravo! Such fun and happy cards!! What a GREAT set of cards! I don't remember seeing that stamp set before; maybe I have but glossed over it, but now I'm interested in getting it! GREAT CARDS! Happy Bday Altenew-thank you for sharing your great cards! Some cool patterns you chose using the geometric stamp set. Loved watching your video. Congrats to Altenew and thanks for the inspiration! The Trigonometry set is one of my favorites. I enjoyed seeing how you used them to create patterns. So much fun! Love these patterned cards! Thank you for sharing! Well done Altenew! And congratulations! I really love your wonderful projects - especially your pretty flowers. Thanks for the card inspiration! Your patterns and bright colors are so fun! Gorgeous Tania, I love that pattern stamping. I have that stamp set and will give this definitely a try. Thank you for your inspiration, video tutorial and participating in this great Altenew 5th Anniversary party. I love strong geometric patterns, so these cards totally delight me. 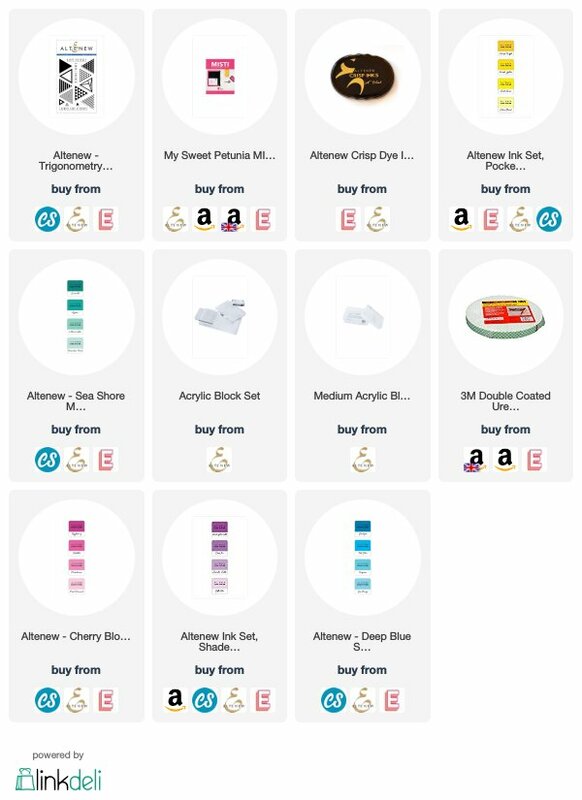 And boy, do the coordinated ink sets save my crafty life! I'm not gifted in color matching, so the mini cubes are so helpful to me. Thanks for sharing these fab ideas. Love the geometric stamps! Could be used to make masculine cards for sure! I've avoiding buying shape stamps because I had NO idea how to use them. Thanks for the inspiration. I have a few and plan to dig them out and give this a try. Thanks. Love your cards. I’m impressed at how easily you lined those up with each other. Very nice! It's fun to see some of Altenew's non-floral stamps being put to use in this blog hop! I especially like the "I admire your strength" card. Happy, happy, happy! - that's how your design made me feel. Love the colors and your compositions. Very creative and unique. Thank you for the inspiration and Happy Birthday, Altenew!. I love the colorful, geometric designs on your cards, Tania! Your designs and layouts are really eye catching! Thanks for sharing your awesome creativity with us! My philosophy is if your fingers aren't inky, you aren't doing it right! :) Great cards! Love the graphic designs on these cards. Congrats to Altenew, and congrats to the design team on so many beautiful projects! Wow I love the geometric designs. This would work for both men and women. Thanks for the ideas! 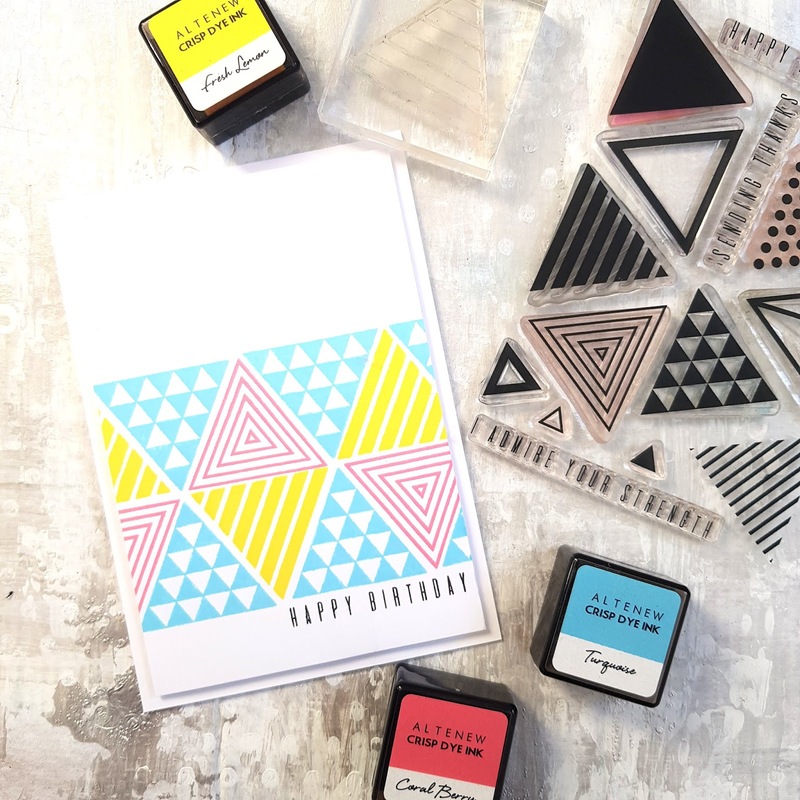 such fun graphic, geometric cards, Tania! I loved your cards and video so much I went and subscribed to your YouTube channel! Thanks for the inspiration! Love the triangles, love the colors, great cards! Very cool geometric designs! Love the bold colors. These are great. You have much more patience than I every would. Beautiful cards! Love your wonderful colors and amazing style. Love the color combos and designs! Pretty cards! I love these!!! So beautiful, and happy looking cards! Amazing graphic backgrounds. Great job! Fantastic and fun cards. Great design. I love the custom backgrounds! Those triangles are so modern. Fantastic cards! I love geometric patterns on cards - they're so versatile! Beautiful work! Happy Birthday Altenew! Really cute cards! And happy anniversary to Altenew! LOVE your cards! They are so colorful and just plain fun! And I own that stamp set, so I will definitely be giving your techniques and ideas a try! Thanks for sharing that video with us as we celebrate Altenew's 5th anniversary! Your cards are very bright and shiny!! So fun!! !